Model rockets have fins and launch quickly; real space launch vehicles don't. With thrust vectoring, your rockets can slowly ascend and build speed, instead of leaving your sight in seconds. Signal R2, a thrust vectoring kit, is here to bridge that gap, enabling model rockets that look, and work like the real thing. The Signal flight computer runs a high speed control loop, prioritizing separate functions depending on the progress of the flight. Thrust vectoring draws considerable current from the power source; once burnout is detected, Signal centers and locks the vectoring mount. Focus is then set on detecting apogee and triggering pyro events. A power source of at least 8V must be used - 9v alkaline or 11.1v LiPos are recommended. The flight software tracks vehicle flight dynamics while the rocket is powered on. Signal looks for cues to shift system states at liftoff, burnout, apogee, and landing. Especially regarding liftoff, this makes Signal's operation simple. Once the settings file is configured for flight, all that is required of the user is turning on the flight computer; Signal automatically enters the pad-idle mode. In pad-idle mode, Signal can detect launch in under 10ms. Once detected, thrust vectoring is activated, in-flight abort is armed, and high-frequency data logging begins. Developed over three years of iterative design, the thrust vector control motor mount is made from 3D printed PLA material. The mount uses two 9g servos, geared down for higher accuracy. The assembly can gimbal a motor ±5 degrees on each axis, X and Y. Though up to 40N of force will work with the mount, it works best with lower impulse motors, especially those with long burn times. In-flight data logging takes place at 40Hz. Vectoring output, vehicle orientation, altitude, velocity, acceleration, and several other data points are recorded using a custom protocol to a high-speed flash chip. Upon landing detection, Signal creates a new CSV file on the micro SD card, dumping flight data into it. Once the data is verified to match, the flash chip is cleared and Signal is ready to fly again. A 1GB Micro SD card can store hundreds of flights before it must be cleared. Flight settings are programable via a settings file on the removable Micro SD card, where in-flight data is also stored. Signal is configured using a app on an iOS or Android smartphone. The app helps the user configure TVC sensitivity, parachute deployment altitudes, the abort system, ground testing, rocket tuning, and more. Check out the video here for more information on how the Signal app works. Signal does not carry any GPS or point-based guidance equipment. The computer is only able to keep the rocket vertically stable off the launch pad. This kit is for advanced rocketeers. The implementation of TVC in model rockets is not perfect, but will improve with time. If you don’t have experience with scratch-built rockets, I recommend honing your skills with an easier build first. If something ships to you and is broken on arrival, send it back and I’ll fix it! I’m committed to making sure all users have a good experience with TVC rockets. 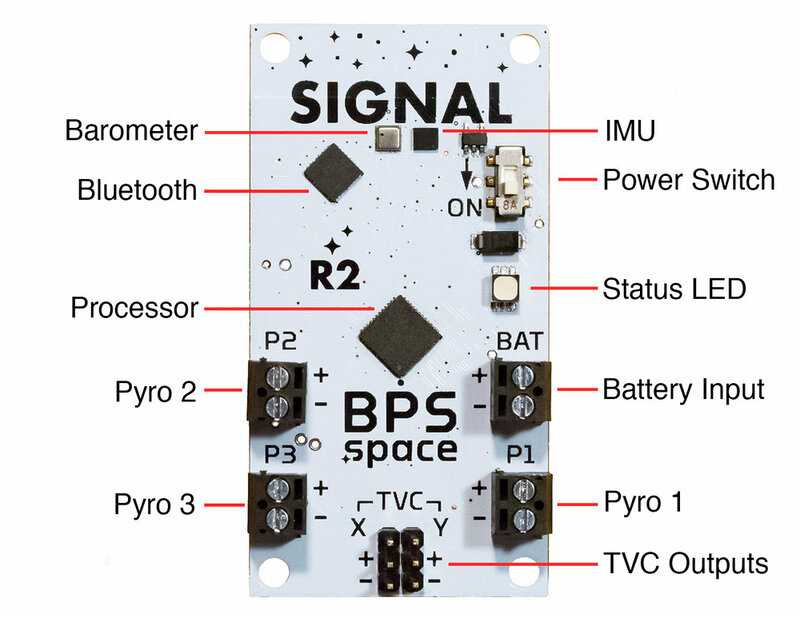 Sales of Signal R2 are limited to United States citizens and residents. There are no exceptions to this - apologies for the inconvenience. Already own Signal R2? Looking for some instructions? Still have questions? Not sure about something? Shoot me a message using the contact form here.